Did you know there are 90 million people in the U.S. providing care to a loved one? In Minnesota alone, an estimated 585,000 people are caregivers. 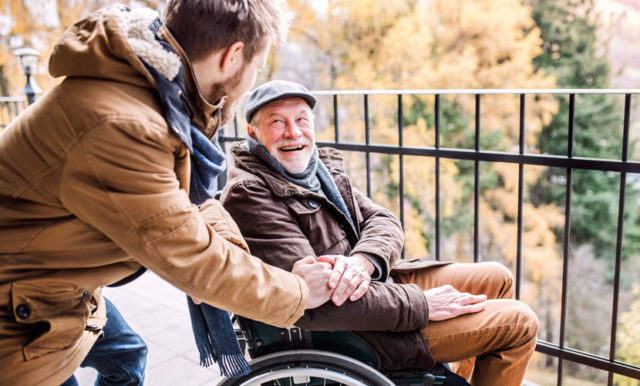 A caregiver is a family member, a friend or any person who provides care for someone else who needs extra help – this could be an older adult, person with disabilities, or someone with a chronic illness. November is National Family Caregiver’s Month and we’d like to celebrate all caregivers for what they do every day. Most caregivers are unpaid, and often what they do goes unrecognized. At times, caregivers’ work can even be isolating. It’s important to recognize that caregivers might neglect their own health needs as they care for others – which can harm their own health over time. Here are 4 ways you can help a caregiver. Much of the focus for caregivers can be the person they are caring for. You can help caregivers by finding out how to care for them! Whether it’s over the holidays or another time, have a discussion as a family with the caregiver. This conversation is a way to recognize all the things the caregiver is doing, find out how to support them, and help them feel appreciated. Sometimes this can be difficult – consider inviting a member from your faith community or a caregiver consultant to help with the conversation. You might want to talk about all the things the caregiver is doing on their own, how you can be helpful and maybe take some of the burden of doing everything off one person, adding new activities to give the caregiver a break, address any conflicts that are getting in the way, and discussing the needs of the caregiver – like building time in their day for self-care. Learn more about support for caregivers. Caregivers need support. There are local groups which support caregivers and are one great option for caregivers to spend time with others who get it. Sometimes it’s hard for family members to understand what it’s like to provide daily care. “Research and anecdotal evidence shows caregivers cope better over time when they receive group support.” – AARP. Caregiver groups can be a place to vent, share, advocate, find community and even get advice. There are opportunities for caregivers to get extra support and education by taking a class, developed just for caregivers, called “Powerful Tools for Caregivers.” If you want to find out about classes in your area go to the Metropolitan Caregiver Services Collaborative: . To read more about how to support the caregiver in your life, go to your local library and ask the librarian about what they have for caregivers – a good book we suggest is “Share the Care” by Cappy Capossela and Sheila Warnock. The best way caregivers can continue to provide care for someone else is by taking care of themselves too. During a typical day, caregivers spend a lot of time caring for someone else they often feel guilty taking time for themselves because they have a lot of responsibilities on their plate. Looking after their mental and physical health will help them when they have difficult days. You can help a caregiver by finding things to do with the person they care for – maybe a coffee date outside the home with the person they care for or staying in and playing cards! Offer to come over and help with small tasks like grocery shopping or doing folding the laundry with the person they care for. Telling a caregiver “You need to take time for yourself!” won’t work and telling them to find time to relax won’t do it either – the best way to help a caregiver is to help directly with a task or two while making sure the person they are caring for is supported. Encourage family caregivers to let you help. Let caregivers know that when you are helping them, they are helping you – maybe they’ll be more open to your support. Caregivers have a hard time taking help, and you can make it easier for them by giving them space in their days to catch up with a friend, take long bath or go to the library alone to read a book. Self-care looks different to everyone, doing whatever seems right is what’s important. What is respite care? Respite care gives caregivers and the person receiving care a break from one another, and usually happens outside the home, but it can also be given in the home. Show caregivers you support them by helping them learn about different options for respite care. This is a more structured way for caregivers to take care of themselves. Informally, respite can be given by family and friends by staying with the person who needs care for a few hours, and up to a few days. More often, respite programs run daily during the week, and have a fee. There are other respite options for longer stays, they are operated through assisted living facilities and long-term care facilities where the person who needs care can stay for a few days, to a few weeks. For more information about Respite call the Minnesota Senior Linkage Line: Senior LinkAge Line® at 1-800-333-2433. For adult women, getting a mammogram is an important step in staying healthy. Below is a quick summary of the top things you should know about mammograms.